Nottingham Playhouse: FULL CAST ANNOUNCED FOR STEINBECK’S CLASSIC THE GRAPES OF WRATH. – East Midlands Theatre. 28 March – 8 April Nottingham Playhouse. 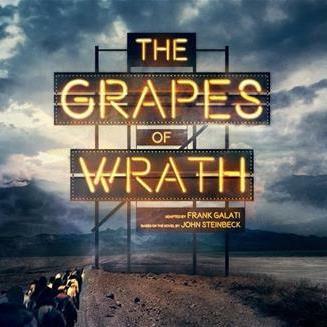 Director Sam Hodges announces casting for the forthcoming production of John Steinbeck’s Pulitzer Prize-winning book The Grapes of Wrath, adapted by Frank Galati. The American dust bowl. The height of the Great Depression. One family begins an epic journey, driven as much by fear as by hope. Route 66 to California, the Promised Land. In search of work. A new life. NST Associate Abbey Wright directs a cast including Ben Bland (Connie), Daniel Booroff (Noah), Brendan Charleson (Casy), Charlie Folorunsho (Pa), Shiv Jalota (Al), Jim Kitson (Uncle John), Pamela Merrick (Granma/Elizabeth Sandry), Amy Molloy (Rose of Sharon), Harry Napier (as cast), Alexander Newland (Muley, Narrator, Vocalist), Heronimo Sehmi (Grampa), André Squire (Tom Joad) and Julia Swift (Ma), alongside a 50-strong community company made of up local residents in each tour venue. The co-production with Nottingham Playhouse, Royal & Derngate, Northampton and West Yorkshire Playhouse opens in Southampton on 14 March, before touring to each of the co-producing venues. Running in tandem with the show at each venue are a series of initiatives in support of refugees, asylum seekers and migrant communities, including free ticket schemes and workshops to overcome language barriers. Abbey Wright said today, “The Grapes of Wrath is uncannily relevant to the world we find ourselves in today; increasing mechanisation, displacement of people, economic and environmental crisis. Across the world we have seen fear and hatred entering political discourse on immigration and identity. At the heart of The Grapes of Wrath is the need for community and love. Steinbeck invites us to ask ourselves ‘Who is our family?’, ‘Who are our children?'”. This vital new production features a community company with live music from Matt Regan (Greater Belfast). Frank Galati won the 1990 Tony Award for Best Play for his dramatisation of The Grapes of Wrath (he also won the Tony Award for Best Director). Since this success with The Grapes of Wrath, Galati has gone on to adapt As I Lay Dying and Haruki Murakami’s After the Quake and original work, such as Everyman. He was an associate director at the Goodman Theatre from 1986 to 2008 where his productions included She Always Said, Pablo, A Funny Thing Happened On The Way to the Forum, Passion Play and The Winter’s Tale. Galati and co-writer Lawrence Kasdan adapted the novel The Accidental Tourist for a film, which was nominated for an Academy Award for Best Adapted Screenplay, a BAFTA Award for Best Adapted Screenplay and a Writers Guild of America Award for Best Adapted Screenplay. The pair won a USC Scripter Award for the screenplay. Brendan Charleson plays Casy. His theatre credits include Insignificance, The Herbal Bed, Under Milk Wood, The Aristocrats, Glengarry Glen Ross, Roots, Taming of The Shrew, Dancing At Lughnasa, Arden Of Faversham, The Suicide, Measure For Measure, The Two Princes, Brassed Off and To Kill A Mockingbird (all for Theatr Clwyd), Talent, Diana Of Dobson’s, Bus Stop (New Vic Stoke), The Rise & Fall Of Little Voice (West Yorkshire Playhouse/Birmingham Rep) and The Accrington Pals (Manchester Royal Exchange). His recent television work includes Trollied, Da Vinci’s Demons, Indian Doctor; and recent film work includes Killer Elite. Charlie Folorunsho plays Pa. His theatre work includes The Trial (Young Vic), The Arrival (Tamasha), Satyagraha (Improbable Theatre and Metropolitan Opera House), Class Club (Barbican), Fermentation (Grid Iron), Peter Pan (Kensington Gardens), Slamdunk and African Cargo (Nitro), The Fireworkmakers’ Daughter and The Evocation of Papa Mas (Told By An Idiot), Timon of Athens and The Lower Depths (Cardboard Citizens), A Christmas Carol (Lyric Hammersmith), To Kill a Mockingbird and The Resistible Rise Of Arturo Ui (Mercury Theatre Colchester). André Squire plays Tom Joad. His theatre work includes Lonely Cowboy and The Refugee Boy (West Yorkshire Playhouse) and Our Style is Legendary (Nottingham Playhouse). For television his work includes The Vice, Jamie Johnson, West 10 Ldn; and for film, Bypass. Julia Swift plays Ma. Her theatre work includes Philadelphia Here I Come, Orpheus Descending (Donmar Warehouse), Suddenly Last Summer (Comedy Theatre), Broken Glass (National Theatre), Chekhov’s Women (Queen’s and Lyric Theatres), Revelations (Hampstead Theatre), Seduced (Finborough Theatre), Ambulance (Royal Court Theatre), Time and The Conways (Old Vic and tour), The Provok’d Wife (The Old Vic), A Midsummer Night’s Dream (Regents Park Open Air Theatre), The Merchant of Venice (Broadway), Two Gentlemen of Verona, All’s Well That Ends Well and Electra (all RSC). Her television work includes The Caucasian Chalk Circle and Broken Glass; and for film, Song of Songs. Abbey Wright is Associate Director at NST. Her directing credits include The Mountaintop, Diana of Dobson’s, Talent, Ghosts (all New Vic), The Cocktail Party (Print Room at the Coronet), The Mentalists (Old Vic Productions/Wyndham’s Theatre), The Father, Mrs Lowry & Song (Trafalgar Studios), Dublin Carol (Donmar Warehouse), Five Finger Exercise (Chichester Minerva), The Glass Supper (Hampstead Theatre Downstairs), The Eisteddfod, Holiday (Bussey Building), The Occupied Times, Lakeboat, Prairie Du Chien (all Arcola Theatre), Sixty-Six Books (Bush Theatre), Rose (Pleasance, Edinburgh), The Song of Deborah, Hidden Glory (Lowry Theatre), Confusions, Restoration Sketch Show (Theatre Royal Haymarket), Anne of The Thousand Days (Old Vic Productions/Michael McCabe) and The Ones That Flutter (Theatre503). She is the Artistic Director of tackroom theatre. She was Staff Director to Danny Boyle on Frankenstein at the National Theatre and the Resident Assistant Director at the Donmar Warehouse under Michael Grandage.